This section contains information on determining if a person is ordinarily a resident in New Zealand. If you are ordinarily resident in New Zealand, you are not considered an overseas person and the consent requirement does not apply. There is a different definition of ordinarily resident for residential land. Use the following diagram to determine your status. If in doubt, refer to the further information in this guide or contact the OIO. An “overseas person” is defined in section 7 of the Overseas Investment Act 2005. Section 6(2) of the Act determines when an individual is ordinarily resident in New Zealand. "Ordinarily resident" is a conjunctive test - you must hold a residence class visa granted under the Immigration Act 2009 and either be domiciled or residing in New Zealand with the intention of residing here indefinitely, having done so for the immediately preceding 12 months. To be ordinarily resident, you must hold a residence class visa granted under the Immigration Act 2009. “Residence class visa” means a permanent resident visa or a resident visa (section 4 of the Immigration Act 2009). This means that the holder of a temporary entry class visa or transit visa cannot be ordinarily resident in New Zealand. “Temporary entry class visa” includes a temporary visa (for example a visitor visa, student visa or work visa), a limited visa or interim visa. Note, a citizen of Australia or a person who holds a current permanent residence visa (including a resident return visa) issued by the Government of Australia may apply for a residence class visa at an immigration control area (see regulation 8 of the Immigration (Visa, Entry Permission, and Related Matters) Regulations 2010). Section 9 of the Domicile Act 1976 governs the acquisition of New Zealand domicile. A person must be residing in New Zealand, with the intention of residing here indefinitely, and have done so for the immediately preceding 12 months. 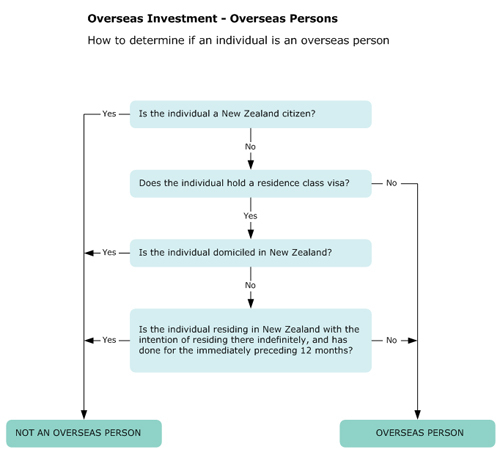 Section 6(3) of the Overseas Investment Act provides that absence in New Zealand for no more than 183 days in aggregate in the last 12 months (counting presence in New Zealand for part of a day as presence for a whole day) does not prevent a person from satisfying the requirement for residing in New Zealand for the last 12 months. "(Of person) have one's home; dwell permanently". In Dempster and Attwell v C or IR 1 Thorp J stated: "The word reside is a word of flexible meaning. In its usual meaning, a person is said to reside where he sleeps. The fact that he may be away at work somewhere else in the daytime does not mean that he is not residing at the home to which he returns each night". In Fox v Stirk & Bristol Electoral Registration Officer 2 , Lord Denning stated: "I think that a person may properly be said to be resident in a place where his stay there has a considerable degree of permanence". Also in Fox v Stirk & Bristol Electoral Registration Officer 3 , Lord Widgery stated: "Some assumption of permanence, some degree of continuity, some expectation of continuity, is a vital factor which turns simple occupation into residence". The 12 month period is calculated having regard to the calendar months elapsed from the arrival of the person in New Zealand to take up residence, to the month in which the giving effect to the transaction, which would have otherwise required consent, occurs. 2. 2 QB 463;  3 All ER 7. 3. 2 QB 463;  3 All ER 7. The diagram is a flow chart that users follow to assess if they are ordinarily a resident in New Zealand. There are 6 boxes in total, of which four ask questions and are linked by answer lines "yes" or "no".